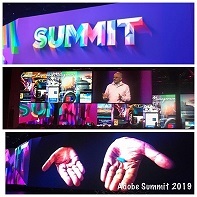 At the end of March each year, marketers all over the world congregate in Las Vegas for the show of all shows: Adobe Summit. The show itself is testament to the mastery of marketing that Adobe has achieved. This year there were over 17,000 attendees. Keynote speakers included the CEO of Microsoft, Satya Nadella; CEO of Best Buy, Hubert Joly; Academy Award-winning actress and CEO of Hello Sunshine media, Reese Witherspoon; and Super Bowl-winning quarterback Drew Brees, to name just a few. The Killers played the main event at the T-Mobile Arena exclusively for the conference. The Summit easily falls into the “epic” category. 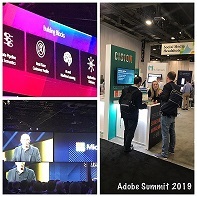 The Cision team had a great Adobe Summit; the idea of Earned Media Management has a foothold in the marketing community, and we experienced this firsthand with traffic to our booth on the partner floor. Kelsey Franjione and Hillary Newport were the Cision booth ambassadors this year and did a great job representing Cision. 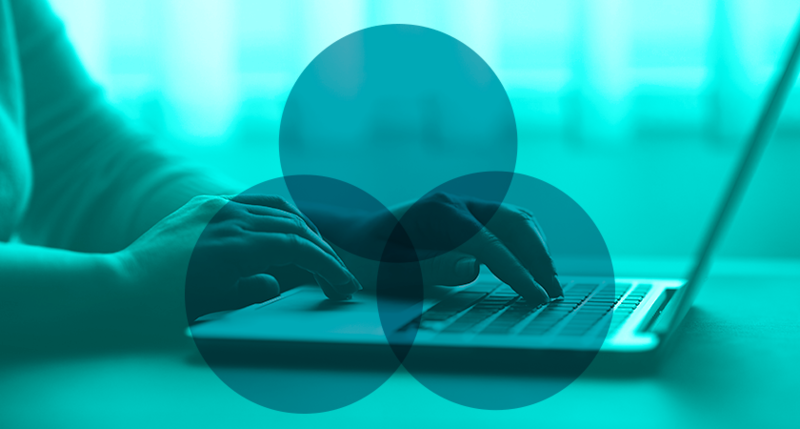 Earned media has always been the mysterious first touch in a customer’s brand experience. Now, with Cision Impact technology, marketers and PR professionals alike can identify and track the audiences that view and engage with earned media and even attribute any conversions from this initial experience. Typically seen as PR’s audience, marketers were intrigued to gain insight into individuals who have read online content that mentions their brand (or their competitors!) before these potential consumers enter the standard sales funnel. Marketers are primed to capitalize on earned media’s organic (and cost-efficient!) success by targeting similar audiences to attract more attention or inspire earned media audiences to take action. 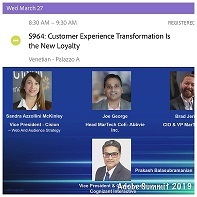 On Wednesday, I was on a panel for a session titled “Customer Experience Transformation Is the New Loyalty,” hosted by Adobe partner (and Cision partner) Cognizant Interactive. My panel colleagues included Joe George of Abbvie Inc., Brad Jenkins of MetLife and Prakash Balasubramanian of Cognizant Interactive, and we were hosted by Bibhakar Pandey of Cognizant Interactive. We were able to discuss the challenges in providing a good customer experience from beginning to end. Some of the biggest challenges that we all face- not just as marketers but through sales and even billing- are data, legacy systems and working with a variety of people (demographic, roles, etc.) that can see or use the same thing very differently. On Thursday, John Ramirez, who has been with Cision/PR Newswire since 2005 and is a web systems business analyst, attended the Marketing Nation day, where Adobe shifted the focus to its newly acquired marketing automation platform, Marketo. Former Marketo CEO Steve Lucas, now Adobe SVP, started his Summit keynote address with an analogy from The Matrix, which got John’s attention. The red pill/blue pill can be a simple choice of reality and fantasy or can have a very tech-centric meaning of virtual reality and be able to control your story. Lucas leaned toward the red-pill scenario, where using your customers’ reality, and not your company’s ignorant bliss, becomes a transformative experience for the company and customers. Experience changes everything, as illustrated by relatively recent companies like Uber or AirBnB, where customer experience have made them institutions. He urged everyone to “make every experience epic” like those companies. 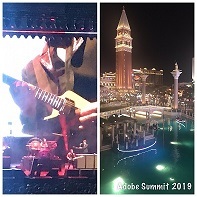 Following the Cognizant session theme- and really the constant theme at the Summit as a whole- was the idea that “experience is everything” to the customer. Customers require a great product and a great experience, and companies must make every effort to provide the greatest experience possible. For Ramirez, “experience is everything” is what resonated during the Summit. Overall, the Summit was a great place to learn about various marketing technologies and how companies use them in the real world to create great customer experiences. “Augmented” everything- from data to customer experience to workflows- to optimize customer experiences is by far the biggest trend for the year. Speakers kept referring to augmenting (using AI in tech/processes) as “hydration” like everything “before augmentation” was a dying plant. For those of us coming home to “water the plants,” the Adobe Summit left us with lots of information and inspiration. Sandra Azzollini McKinley is Vice President, Audience and Web Strategy at Cision. In her role, Sandy oversees several of the company’s owned properties, including Cision.com, PRNewswire.com and PR Newswire for Journalists, ensuring the audience experience is consistently seamless, useful and engaging. The websites have been honored with several industry awards, including two CODiEs, Best Online News Service and Best Online Business Information Service: Non-News; Bulldog Awards, Best Website; and Web Marketing Association’s Best Public Relations Website Award. Sandy holds a BA and an MBA from Rutgers University, and has served as President of the Rutgers Executive MBA Alumni Association. She was the recipient of Rutgers’ Joel E. Kelly Leadership Award. She has also written articles on customer experience for several publications, including PR Daily, the Cision blog and Beyond Bylines.